PATTERSON, GEORGE, journalist, Presbyterian minister, author, and antiquarian; b. 30 April 1824 in Pictou, N.S., son of Abraham Patterson and Christiana Ann MacGregor; m. 20 March 1851 Margaret McDonald in Sydney County, N.S., and they had eight children; d. 26 Oct. 1897 in New Glasgow, N. S.
George Patterson’s paternal grandfather, John, one of the Scottish emigrants who arrived on the Hector in 1773, is recognized as the “Father of Pictou.” His paternal grandmother, Ann, was a daughter of Matthew Harris, a member of the Philadelphia Company, which had settled the Pictou area in 1767. His father was a leading merchant and his mother a daughter of pioneer Presbyterian minister James Drummond MacGregor*. Patterson was educated at Thomas McCulloch*’s Pictou Academy, and he later studied with McCulloch at Dalhousie College. He interrupted his education between 1843 and 1846 to serve as the first editor of the Eastern Chronicle, published at that time in Pictou. In 1846 he departed for Edinburgh, where after studying at the university he was licensed to preach on 1 Feb. 1848. Upon his return from Scotland, he received a call to Salem Presbyterian Church in Greenhill, Pictou County. He was to hold this charge from his induction on 31 Oct. 1849 until he resigned on 30 Oct. 1876, possibly because of a scandal involving his brother and the Customs Department. For his labours on behalf of a congregation that throughout most of his ministry remained at about six hundred, he received an annual salary that rose from £125 at the outset to more than $700 when he resigned. 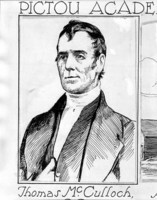 His contributions to and activities within the Presbyterian Church of Nova Scotia (which in 1860 joined with the Free Church to form the Presbyterian Church of the Lower Provinces of British North America) were many and varied. During the years 1850–67 he edited or co-edited three major regional church publications. He helped to establish and served on such bodies as the Ministers’ Widows’ and Orphans’ Fund, the Aged and Infirm Ministers’ Fund, and committees to establish a cooperative insurance fund for church property and to collect and preserve historical records. In the 1870s he was the principal draftsman for the church’s rules and forms of procedures. Following his resignation from Salem Church in 1876 and his move to New Glasgow, he remained active in church affairs. In 1878, on behalf of the national Presbyterian Church in Canada, he travelled to Britain on a less than successful fund-raising trip to solicit donations for the fledgling Manitoba College [see George Bryce*]. There is in Patterson’s entire career a sense of unfulfilled dreams. He yearned to emulate the foreign missionaries about whom he wrote with such conviction, but the opportunity never arose. George Renny Young*, commenting upon Patterson’s early efforts in journalism, told him, “You have a pen which ought to give you a wider destiny.” Although he travelled extensively, Greenhill and later New Glasgow were the boundaries of his life’s work. His obvious knowledge of and expertise in all matters pertaining to the church should have brought him offers from many other churches after his departure from Salem at the age of 52, but none came. Patterson must have been galled by this neglect, but who would have understood better than he the Byzantine workings of the Presbyterian church in Pictou? His last major work was an unpublished study of pioneer Presbyterian ministers in the Maritimes, which he had hoped to issue on a subscription basis. Although Patterson’s writings earned him the respect of the scholarly community, in the end he had to solicit the assistance of Sir John William Dawson in order to become a member of the Royal Society of Canada in 1889. This reserved and dignified gentleman, however, never permitted adversity to sully his attitude or his work. Early in his career he had stated he would write “with a patriot’s eye,” and to the end he was faithful to that credo. He lies today in Riverside Cemetery, New Glasgow, but his writings keep his name alive and respected. The manuscripts of George Patterson’s three Akins prize essays, “A history of the county of Pictou” (1874), “A sketch of the French Protestant emigrations to Nova Scotia” (1893), and “An historical account of Sable Island” (1894), are preserved in the Akins Hist. Prize Essays collection at the Univ. of King’s College Library (Halifax). The 1894 paper was published under the title “Sable Island, its history and phenomena,” RSC Trans., 1st ser., 12 (1894), sect.ii: 1–49. A bibliography of Patterson’s writings appears in RSC Trans., 1st ser., 12, proc. : 62–63. The National union catalog lists several additional articles and monographs, but also incorrectly includes under his name works by his son, George Geddie Patterson. Patterson’s “Report of agent for Manitoba College” appears in PCC Acts and proc., 1879: cxxi–cxxiv. His most important work, A history of the county of Pictou Nova Scotia, originally published in 1877, has been reprinted (Belleville, Ont., 1972). Patterson also edited a collection of his grandfather’s writings under the title A few remains of the Rev. James MacGregor D.D. (Philadelphia, 1859). He was editor or co-editor of Presbyterian Church of Nova Scotia, Missionary Reg. (Pictou, N.S. ), 1 (1850)–6 (1855); its successor, Christian Instructor, and Missionary Reg. (Halifax; Pictou), 1 (1856)–5 (1860); and Presbyterian Church of the Lower Provinces of British North America, Home and Foreign Record (Halifax), 1 (1861)–7 (1867). McGill Univ. Arch., MG 1022, George Patterson to J. W. Dawson, 17 June 1887. PANS, Churches, Salem Presbyterian Church (Greenhill), minutes, 1848–89 (mfm. ); MG 1, 742–44; 3088, no.3; MG 2, 722, F/2, no.671. Presbyterian Church in Canada, Synod of the Maritime Provinces, Minutes (Halifax), 1875–79. Presbyterian Church of Nova Scotia, Minutes of the synod (Halifax), 1859–60. Presbyterian Church of the Lower Provinces of British North America, Minutes of the synod (Halifax), 1860–75. Eastern Chronicle (Pictou; New Glasgow, N.S. ), 27 March 1851; 1 Nov. 1877; 28 Oct., 4 Nov. 1897. Robert Stewart, Colonel George Steuart and his wife Margaret Harris: their ancestors and descendants . . . (Lahore, India, 1907). Frederick Pauley, History of Salem Presbyterian Church, Green Hill, Pictou County, Nova Scotia ([n.p. ], 1966). A. C. Dunlop, “George Patterson: a Pictou historian,” N.S. Hist. Soc., Coll., 42 (1986): 81–92; “Salem Church and Dr. George Patterson,” Presbyterian Hist. (Hamilton, Ont. ), 29 (1985), no.2. Eric Ross, “A Canadian abroad in Edinburgh University, 1847/48,” Univ. of Edinburgh Bull., January 1986: 11–14. M. B. Taylor, “Nova Scotia’s nineteenth-century county histories,” Acadiensis (Fredericton), 10 (1980–81), no.2: 159–67. Allan C. Dunlop, “PATTERSON, GEORGE,” in Dictionary of Canadian Biography, vol. 12, University of Toronto/Université Laval, 2003–, accessed April 21, 2019, http://www.biographi.ca/en/bio/patterson_george_12E.html.